KARL BOYES made his way out of competitive amnesty to take down a highly talented UK Open field and walk away with the top prize and 28 Mosconi Cup ranking points for his weekend’s work. 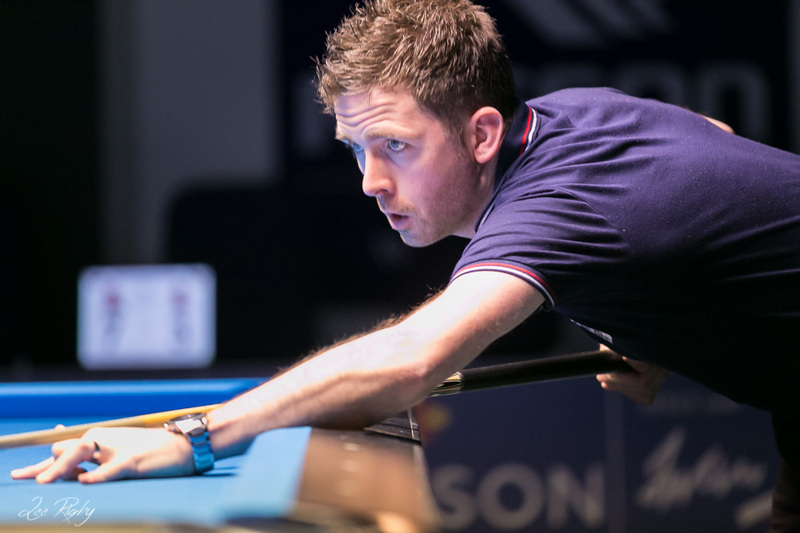 It was the first GB9 event played by Boyes since his victory in the 2016 British Grand Prix back in November, with the prestigious Mosconi Cup ranking points on offer providing the perfect motivation for ‘Gwapo’ to bring his ‘A’ game and become the fourth different winner of the event in as many occurrences. The 2017 GB9 UK Open was upon us, and some of the best players in the world had descended on Telford in what could legitimately be described as the toughest field ever assembled at a GB9 event. The UK’s finest were here of course – Osborne, Peach, Melling, Gray et al, joined by European legends Souquet, Feijen, Alcaide, topped up by next generation superstars like Jayson Shaw, Francisco Sanchez Ruiz and Joshua Filler. In addition, there were six females playing in the event, a record for GB9, and proof of this wonderful game’s universal appeal. Into the first round of matches, GB9 stalwart Craig Seeney was the first player to get a taste of the open nature of the draw, where he drew legend of the game Niels Feijen in his first match. Craig brought his best game to the table, not missing a single ball. But it wasn’t enough, as Niels still managed to ease to a 10-3 win. His roomie, fellow GB9 regular Chris Cowie and arguably the more talented of the two, was up next, facing young Spaniard Francisco Sanchez Ruiz. With three break and runs however, Francisco didn’t break a sweat and moved swiftly to the next round, not dropping a single rack. Meanwhile Chris Melling survived a scare in the first round, beating Scotland’s Joni Holden 10-9 in a hill-hill thriller. In another early round game, former World Champion Daryl Peach had to draw on guile and experience against youngster Elliott Sanderson, in another deciding-rack shootout. Elliott, showing his promise and potential, arguably out-shot Peach, coming with 3 break and runs to Peach’s one. Peach however, showed how you need the full package of skills to progress, and kept a cool head, taking out a tough final rack clearance. Young German Pia Blaeser was flying the flag for the strong female contingent, but she had a tough draw. She performed respectably however, taking five racks off Mosconi Cup hopeful Mark Gray, and three off Derby-based potter Kev Simpson. But for an error with her not being fully up to speed with the GB9 3-point rule, she may well have taken the match with Simpson closer, as she conceded the table more than once, incorrectly thinking she hadn’t made three points on her break. She’ll be fully aware of this for next time I’m sure! There was also a heavyweight match-up early on, with man of the moment Jayson Shaw meeting Daryl Peach. However, Peach looked somewhat out of sorts, and was defeated heavily 10-3 – perhaps the hill-hill previous match against Elliott Sanderson had taken too much out of him. Shaw flew through this one – breaking and running out three times. As the tournament got to the business end, we were down to the expected heavy hitters, with no ‘easy’ draws left. In the last 32 Chris Melling defeated legend of the game, the Kaiser, Ralf Souquet 10-6, before then losing to Mark Gray. Gray then went on to beat Chris Fraser, before succumbing to Karl Boyes, who in turn went on to reach the final. Boyes had come to the event a little cold by his own admission, and was struggling with a tip problem. Nevertheless, he found his groove and was a well deserving winner, taking out David Alcaide, Imran Majid, Elliott Sanderson and Jayson Shaw in the final. Jayson will be feeling a little hard-done by, having not had much luck with the break in the final. Boyes however wouldn’t have lost any sleep over it, keeping composed with a late run out to take his share of the cash prize, the beautiful GB9 UK Open trophy, and of course, those all-important Mosconi Cup points. With him not playing on the Eurotour at the moment, to get into the 5-man team, he’s going to need every last one. Due to the UK Open’s format being different to a normal Tour stop, the lay of the land was a bit different to what we normally see in the two challenge events, especially in Tier 1. A few of the big-hitters usually challenging for the event were off making a run for the main UK Open title, leaving some hungry 9-ballers ready to seize the opportunity. Unfortunately for them however, there was a notable early-exiter from the main event, Current UK Ranked number 1 Craig Osborne, who most installed as favourite for the competition. The first round of matches was not without its hard-fought battles however. Jon Davies ran Chris Cowie close, with it finishing 9-7. Michael Brisley, yet to fully commit to 9-ball pool, beat Dave Hopkin 9-6 in an impressive performance. Phil Wildman suffered a disappointing defeat against Andy Worthington, 9-6, who continues to show an impressive level of consistency for a number of years now. In an early shock, Dean Sporton suffered a whitewash to up-and-coming Kurtis Weaver. Weaver may have been the favourite, but few would have predicted a 9-0 scoreline. Sadly for Weaver though, this was where his run ended, with him losing a hill-hill decider to Chris Cowie. Cowie was then on the opposite side of a hill-hill game, losing to Andy Worthington in the semi-final. In the other semi, Craig Osborne was making light work of Pole Wojciech Trajdos, after previously dispatching Martyn Taylor and Adrian Hickson. Worthington put up a good showing in the final, matching Osborne for break and runs. Osborne however showed why he’s been one of the UK’s finest for a number of years now, taking the win with a 9-6 victory. Finally, the Challenge Tier 2 event got off to a flyer, with some strong competition and notable showings from our lady competitors. Fi Radomski ran the ‘Cyclone’, Mark Collins, close, and Warangrat Hickson did the same up against Lee Noble. German Pia Blaeser managed to survive a hill-hill scare against Mark Morris, in a tightly fought game that got very nervy for both players in the last few racks. Craig Seeney looked out of sorts as he crashed out to Can Ibrahim early on, who then went on to beat John Davies in the next round, in a match far tighter than the 9-5 scoreline suggests. Nathalie Seichter put in a strong showing against Julian Roper, but Roper found a gear and finished the match strongly after a competitive start to the game and nervy middle. Roper then went on to play Can Ibrahim in a match that started brightly, with Ibrahim racing to a decent early lead. Failure to consolidate however turned what could have been relatively comfortable win, into a very nervy affair, with Ibrahim surrendering his lead and then trading racks with Roper to lead to a hill-hill finish. Roper showed great composure in the deciding rack to take out a difficult run-out though, and let out a cry of emotion as he sank the winning 9-ball. Steve Chick meanwhile was quietly but effectively working his way through the field, including a particularly impressive win over Dean Thompson, and then Julian Roper in the semi-final. In the final he faced Paul Ratcliffe, who in truth, never really got going. With a break and run to his name, Steve eased to a comfortable 9-3 victory and his maiden GB9 tournament win. Well done Steve! The GB 9 Ball Tour will return for the 2017 edition of the Southern Masters on September 29 – October 1. If you wish to play this event please fill in the event entry form before the deadline of 29 August. In 2017 GB9 is proudly sponsored by Rasson Billiards, Simonis Cloth, Aramith Billiard Balls, McDermott Cues and Carlson Rezidor Hotels making the perfect combination of the very best equipment in the most outstanding venues.